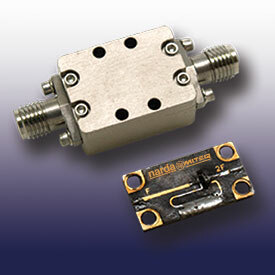 Schottky diode Frequency Multipliers are lowest cost and require the least input power (+10 dBm). Output noise is at room temperature (KTBW). The resulting current waveforms, however, have a high duty cycle (ie, square wave=50%) and therefore, higher multiplier harmonics above the fifth decay quickly. Step-recovery diodes have impulsive waveforms with comb-like output spectrums. The Frequency Multiplier input circuit is more complex requiring a compromise between bandwidth and efficient coupling to the low diode series resistance. The required input power is a function of the SRD capacitance and quickly rises with frequency (+20 dBm typical at 1 GHz). The hyper abrupt varactor diode (indistinguishable at high frequencies from the SRD) yields the higher output powers and efficiency, provided that unwanted sidebands are reactively terminated. 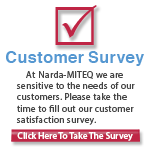 L3 Narda-MITEQ has successfully made efficient frequency doublers and prescalers (halfers) at 10 and 20 GHz.